A couple of weeks ago I uploaded an article on The power of Happiness and how a change in attitude lifted the performance of the Australian cricked team. Now the well known ‘Lazy Project Manager’, Peter Taylor has taken this idea one step further. Building on from the ideas of Richard Branson, of the Virgin Group, who said ‘Have fun, success will follow. If you aren’t having fun, you are doing it wrong. If you feel like getting up in the morning to work on your business is a chore, then it’s time to try something else. If you are having a good time, there is a far greater chance a positive, innovative atmosphere will be nurtured… A smile and a joke can go a long way, so be quick to see the lighter side of life’. 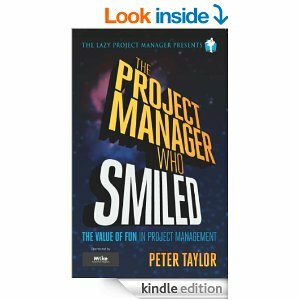 Peter has just published a new book dedicated to project management fun (jokes, stories and case studies) called ‘The Project Manager Who Smiled’ and for 5 days from 30th June you can get it free in eBook form from Amazon! Being in a good mood (ie, happy) doesn’t just feel good, it stimulates your efficiency at work; ‘being responsible’ ranked first, ‘happiness’ second in a survey of 2000 project people asked to vote on what encourages efficiency. 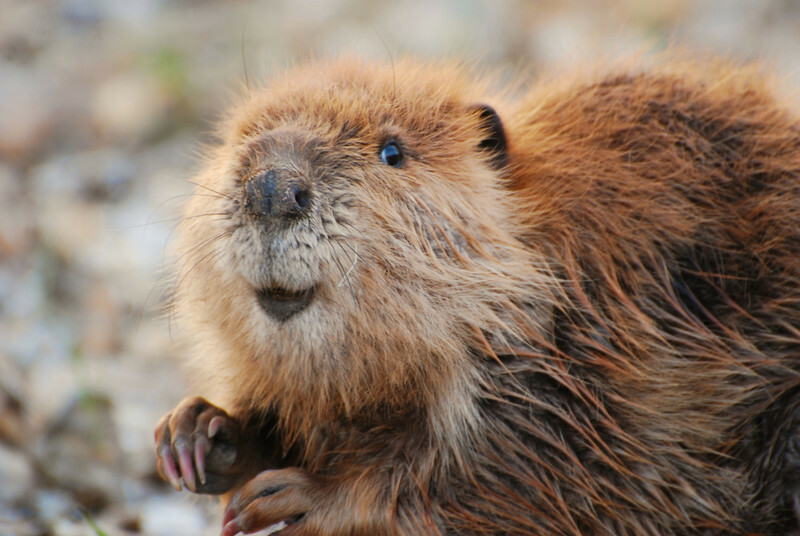 To read more of Peter’s thoughts on this subject see his latest post: Project Management Fun. Then to download his free e-Book visit Amazon.com before the 5th July and grab your copy of The Project Manager Who Smiled (The Lazy Project Manager). It may take your Productive Laziness to a whole new level. The ‘surprise’ recorded in our local paper over the release of a Senate enquiry into the wealth management practices of the CBA (Commonwealth Bank of Australia) is itself rather surprising. The systems developed by the CBA were effectively (even if unintentionally) designed to generate sub-optimal outcomes for people seeking advice from the CBA financial planning system. And whilst the CBA affair has a way to go, the three clear lessons for all governing bodies and managers should already be obvious; you get the behaviours you encourage (KPIs matter), the normalisation of deviance is a constant threat and focusing on shareholder value over stakeholder value will paradoxically always destroy shareholder value! For non-Australian readers the executive summary of the Senate report makes chilling reading. A few weeks back I published an article entitled ‘What you measure is what you get’ the core message in this article was that people will understand precisely what matters to their managers by observing the behaviours those managers incentivise and will adapt their behaviour to succeed in the ways defined by the incentive / KPI system. The Senate report suggests the incentives paid to CBA financial planners actively encouraged them to sell high risk products. Additionally, the KPIs and bonuses paid to several layers of managers overseeing the planners were directly tied to the profits made by the planners under their control. In short, the incentive system was designed to encourage the behaviours that occurred, placing the maximisation of bank profits ahead of good outcomes for their clients. Whilst I’m sure there were countervailing policies within the CBA that talked about customer satisfaction, the strength of the message from the incentive / bonus / KPI system would be much stronger – actions really do speak louder than words. The transgression from bad policy to bad behaviour, possibly criminal behaviour, is a classic example of the ‘Normalization of Deviance’. The Normalization of Deviance’ is a social process that can affect any close knit group. American sociologist Diane Vaughan describes the social normalization of deviance as meaning that the people within the organisation, or group, become so accustomed to a deviant behaviour that they don’t consider it as deviant, despite the fact that the behaviours far exceed their own ethical standards or ‘rules’. I touch on this subject in Chapter 1 of my new book ‘Making Projects Work’ that will be published next year. A recent article by Jeffery Pinto also highlights the critical linkages between governance, project management and the risk of the ‘Normalization of Deviance’ (see: ‘Project Management, governance and the normalization of deviance’). More on this important topic later. The third lesson is possibly the most important. The CBA financial planning system was designed to put shareholder value (bank profits) ahead of stakeholder value. The stupidity of this short term view of the world has been demonstrated time after time with damaging headlines and the trashing of value caused by short term profit focus. 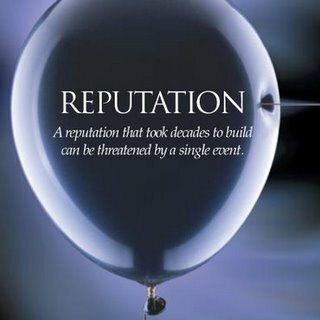 A couple of examples include the damage caused to BP by the Deepwater Horizon disaster and the disastrous loss of reputation suffered by, and $1.2 billion fine paid by, Toyota caused by the Lexus ‘sticky accelerator’ tragedy. I suspect the CBA will be added to this list soon. As the ‘father of stakeholder theory’ Ed Freeman has been saying for more than 20 years, the creation of stakeholder value is the best way to create shareholder value. As I discovered a couple of weeks ago, his message is as compelling today as it ever was. The reason I find this whole saga of interest is a direct personal experience. Quite a few years ago I took over the management of my mother’s finances. At the time her savings were invested in a product from a major commercial financial services organisation. The structure of the package was very well crafted but we noticed over a couple of years how little savings had grown compared to my own. We transferred my mother’s funds into a different structure where we pay fees monthly up-front. The difference in the rate of growth of the funds was dramatic. Whilst we see all of the fees being paid each month to our financial advisers (and they are much higher then the fees we could ‘see’ in the commercial package), the hidden fees must have been enormous and definitely included trailing commissions paid to the adviser that set up the scheme for my mother in the first place. There was no malpractice involved in my mother’s case but the net results were probably sub-optimal and certainly influenced by commissions paid to the adviser. Which brings me to final thought focussed on how the Australian Government will deal with the recommendations arising from the Senate report over the coming months. Are they going to continue to look after their ‘shareholders’, the major banks and other contributors to the Liberal Party coffers or are they going to look after their stakeholder community? The big difference between politics and business is it’s the shareholders who ultimately decide on the management of the business, it’s the stakeholders who decide on the next government. It will be interesting to see if stakeholder management has made its way onto the government’s agenda. His paper Practical project controls – the art of getting to ‘Done’! will be available after presentation. Click to view abstract. Her topic is: Doing stakeholder relationship management in South America. For more information download the AIPM event flyer. From 1st July 2014, AXELOS, the joint venture company that has taken over responsibility for the PRINCE2 credential, will recognise the PMP and CAPM qualifications as acceptable alternatives to the PRINCE2 Foundation qualification. Previously, passing the PRINCE2 Foundation qualification was a mandatory requirement for sitting the Practitioner level exam (although most people did both exams on the same day). From July AXELOS will recognise qualifications awarded to Practitioner candidates by the Project Management Institute (PMI) and the International Project Management Association (IPMA). The Foundation qualification is a relatively straightforward 75 question multi-choice exam with a 50% pass mark so whilst welcome, this concession by AXELOS does not in any way suggest equivalence between the qualifications. One of the clearest messages emerging from a range of sources is that ‘project management’ as defined by the PMBOK® Guide and other similar documents is simply not enough! As Professor Peter Morris has been advocating for more then a decade, organisations need to be able to effectively manage projects. The concept of strategically managing projects describes the organisation’s ability to select, nurture and deliver the right projects and programs effectively. This includes an emphasis on the ‘front end’ of the overall process to ensure the right projects and programs are selected and initiated for the right strategic reasons and the ‘back end’ to make sure the outputs from a project are used effectively by the organisation to realise the intended benefits. Traditional ‘project (or program) management’ deals with the messy bit in the middle – delivering the required scope efficiently. Project management skills are well defined as are some aspects of the strategic management of projects such as portfolio management and benefits management. 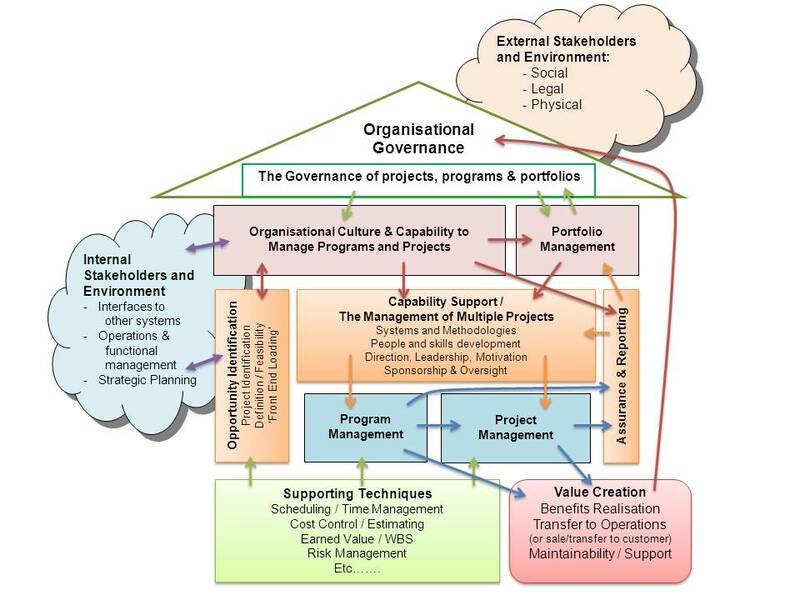 What has still to emerge in the executive management and governance layer of an organisation’s hierarchy is an understanding of the integrated nature of the strategic management of projects. At the moment in many organisations the executives and ‘governors’ who allow their organisations to create failure after failure seem to be able to emerge unscathed by blaming the failures on lower level managers within the organisations they have created. Some of the reasons projects are ‘set up to fail’ are discussed in this post by Patrick Weaver. From my perspective, this is a systemic failure of governance and the governing bodies should be held accountable for the destruction of stakeholder value associated with systemic project and program failures. The governing body should not be directly accountable for any specific project failure, rather for failing to develop their organisation in a way that enables the effective development of a realistic and achievable strategy, and then strategically managing the right projects and programs needed to implement the strategy. An overall framework for this type of strategic management of projects is outlined in our White Paper. Implementing the organisational change needed to create the broad range of capabilities needed to implement the strategic management of projects requires sustained senior executive support and a group of determined, enthusiastic and resilient practitioners to develop the organisations ‘project delivery capabilities’. 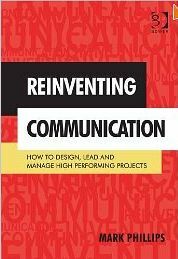 The biggest challenge is very few practitioners can explain what they are recommending in a language that is meaningful to executives or really understand the type of information executives need to make the best decisions. Unfortunately complex detailed reports with dozens of RAG traffic lights and a focus on ‘time and budget’ won’t do the job. A different reporting paradigm is needed that looks at strategic alignment and the delivery of benefits to the organisation and its stakeholders. Some ideas on the best ways to effectively communicate with executives are discussed in my book Advising Upwards. It is definitely time to move the strategic management of projects to the next level and that is firmly into the ‘C-Suites’ and board rooms of organisations. Once this is accomplished, professional project managers will be better positioned to deliver their part of the value chain effectively.